When The Feminine Mystique by Betty Friedan was published in 1963 women who read it gave copies to their friends. 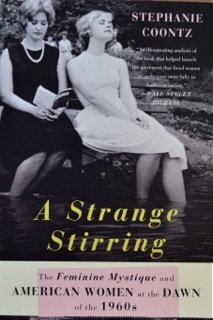 Similarly, a friend loaned me A Strange Stirring by Stephanie Coontz, a recent book about the influence of The Feminine Mystique. While the title of Coontz’ book refers to the “stirring” caused in women by Betty Friedan’s book, it was Coontz’ book that aroused the “stirring” that often burbles within me. I worry as conservative forces throughout the world cover up women, prevent their access to birth control, and re-define their roles as subservient to men. I fret that young women today do not realize how recently their rights were won in this country and how fragile they might be. My own feminist “stirring” came not from The Feminine Mystique but from The Women’s Room by Marilyn French. There is a scene in the book where one woman helps another woman by writing a check for her—without asking her husband. It seems foolish now, but I wept uncontrollably when I read those last words. According to Coontz, it was only forty years ago that a woman in New York City was denied the right to rent an apartment unless her husband signed the lease—and he was in a mental institution. Forty years ago, a woman was not allowed to keep her maiden surname in Illinois because it would make it too difficult for motel owners to promote moral standards. It was only twenty years ago that North Carolina recognized that a woman could be raped by her husband. For those young women who believe their rights will remain, now that they have been won, I would recommend Margaret Atwood’s The Handmaid’s Tale. In her story, during one night—only one night—the credit cards and employment of every woman are terminated. (That book gave me many more nightmares than 1984 ever did.) Women live in enough fear, and I do not wish to burden them further, but we do need to be aware and to protect the rights we assume are sacred and secure.